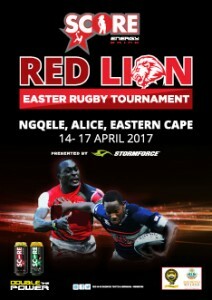 The Score Red Lion Easter Rugby Tournament, one of the highlights on the Eastern Cape club rugby scene, kicks off for the 20th time with a new title sponsor, Score Energy Drink. This year the event will take place in Alice, the home turf of the Red Lion Rugby Club. As the new sponsor of this long established club rugby tournament which has taken place annually since 1998, Score, one of the country’s biggest selling energy drinks, cements its commitment towards the development and promotion of rugby in rural areas. Hosted by the Red Lion Club and presented by Stormforce, an Eastern Cape sports equipment company, this annual club rugby tournament, has attracted 36 teams from clubs throughout South Africa including the Eastern Cape, Gauteng, Free State and Western Cape. The teams comprising senior men, youth and women’s rugby, will compete over the entire Easter long weekend from 14 – 17 April at the Nqgele Location Sport Fields in Alice. With Alice being the home town of the late Makhenkesi Arnold Stofile, Minister of Sport and Recreation from 2004 until 2010 and his brother, the late Michael Stofile, who was the Deputy President of the South African Rugby Union (SARU), the Red Lion Rugby Club, has dedicated this tournament to build on the memory of these legends in the world of rugby. ”It is a great honour for the Red Lion Club to host an event of this magnitude to embrace rugby in the Amathole District Municipality under the auspices of the Raymond Mhlaba Local Municipality. With the help of Score Energy Drink we can promote a healthy lifestyle and educate our communities about the dangers of being involved in crime by offering sport as an alternative. We are looking forward to the task and welcoming clubs from different provinces throughout South Africa,” says Tournament Director, Elliot Fana. The 28 teams in the Senior Men’s category include eight teams from the Alice area, while the Youth category comprising two under-13 and two under-16 teams are all local. The Senior Ladies category has four teams competing this year with two home teams and two away sides. What started essentially as an initiative to involve more women in sport in the Alice community, has become an integral part of the Score Red Lion Easter Rugby Tournament. Women’s 7’s teams competed for the first time in 2015 and their participation has evolved into a full 15-a-side category since last year. The Red Lion Rugby Club aims to grow female participation in sport even further by encouraging more women’s teams to partake in club activities. “We are extremely proud of what has been achieved in our area so far and we are grateful that Score Energy Drink has given us the opportunity to preserve a rugby culture in our village,“ adds Fana.